If you’re wondering who this fluffy, gargantuan-snow creature is? You’e not alone. Meet Freddy the Yeti, SnugZ USA’s cherished mascot. He’ll make appearances throughout our office and he’s got his own Comic Series. We hope you enjoy this as much as we do. Aren’t baths the best? We’ve always thought so. If you’re looking for that next great item to recommend to your customer and have already exhausted sanitizer, lip balm, mints, sweets, stress relievers, polos and pens—we’ve got the ace for you! You’ve most likely experienced an e-mail or phone call where your client is adamant you provide them with the next latest and greatest item sure to dazzle. This next go around, give the gift of relaxation by choosing an item of our Zen line. 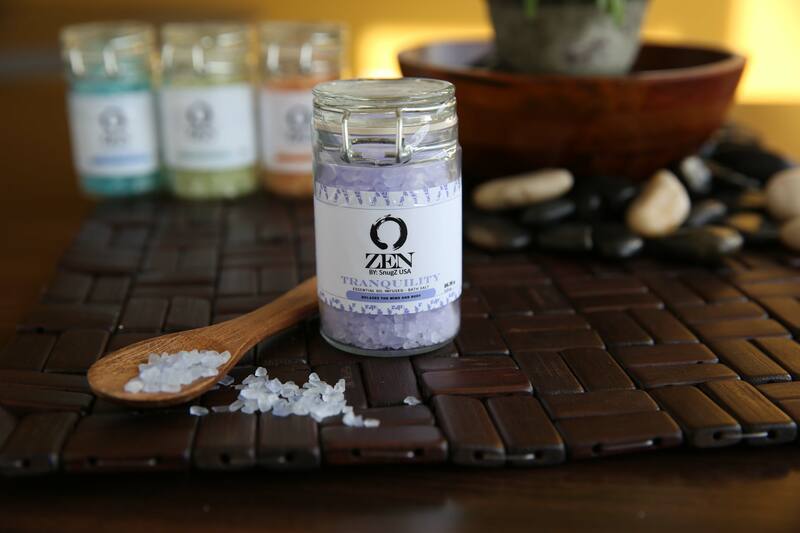 Zen is our aromatherapy line offering therapeutic grade essential oils extracted from nature. Our mix of proprietary blends and single oils were brought on board to help balance, harmonize, and promote health of body, mind, and spirit to the promo world. This year, SnugZ USA was the first to introduce such an offering of essential oil and blends to our market. Aside from bath salts, we offer an assortment of amber bottles, roller balls, soaps, candles, bath bombs, diffusers, and limited holiday scented candles. 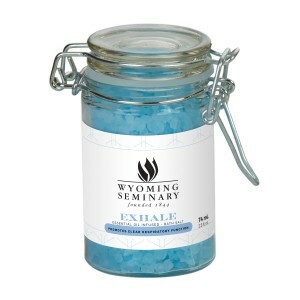 That being said, we recommend our Zen Bath Salts in a Clear Glass Wire Bale Jar, sku NBSWB25. Sooth your customers into zen this holiday with our essential oil infused bath salts bundled in a crafty, eye-catching 2.73 oz. container. Bathing in an essential oil infused salt bath at home provides the ultimate aromatic, escape from work and life’s stresses as salts release their calming properties designed to uplift one’s mood and reduce stress. Our essential oil salts were handcrafted to cleanse and improve health to the body’s largest organ—your skin. Unfamiliar with how to use bath salts? It’s simple. We have seven notable proprietary blends to fill your container with. Pictured below is our Exhale blend made from peppermint, tea tree, eucalyptus and lemon ingredients formulated together to maintain clear airways and breathing, support overall respiratory health, and help minimize effects of seasonal threats. We use Epson salt for our Zen combinations and the benefits are abundant. Epson consists of magnesium and sulfate mineral compounds which are natural agents that help reduce muscle inflation, increases energy and stamina, produce serotonin, and relax and reduce irritability. Bath salts are a trendy spa item and are a hot commodity in retail. Chances are you’ve seen these soap and spa displays at your local grocery near checkout and the pharmacy. Furthermore, this fun-size beaker offers a diverse amount of uses making it a multipurpose bottle. Its small size capacity, trendy exterior and re-useable ability makes it a versatile item you can refill with kitchen spices, daily prescription, or small purse items. It’s no wonder Sales Executive, Janice Freij recommended it. 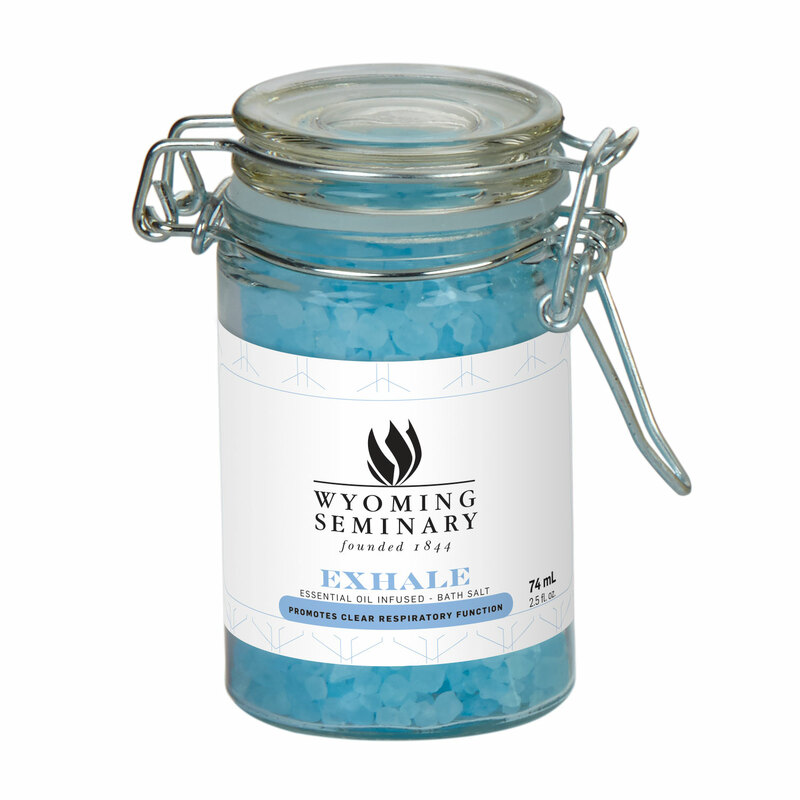 Bath salts are a fantastic fit for hospitals, health clinics, spas, hotels, and assisted living centers. Minimum quantity starts at 50 pieces per order at $4.48 (C ) plus a $45.00 (C ) set up charge. 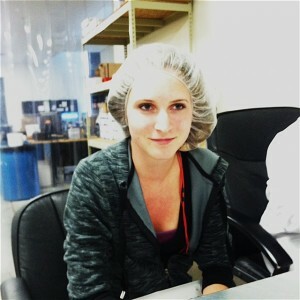 Allow five business days for production time after proof approval. Janice is a part of our valued Sales Dream Team. 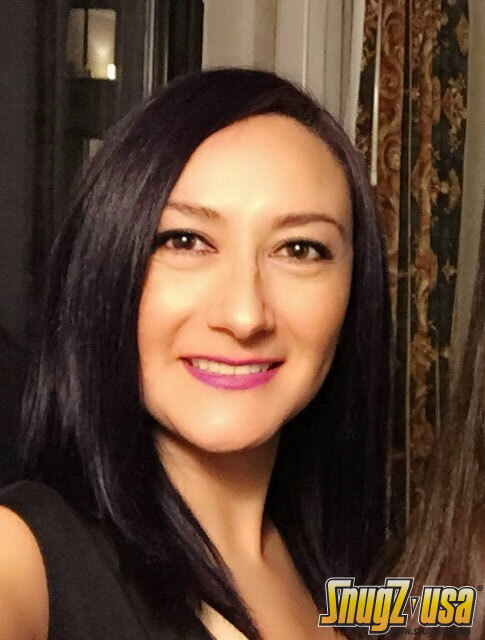 She embodies an extensive insight in promotional know how and is in direct contact with customers on a daily basis. 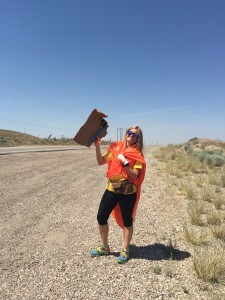 She’s plays an integral role in representing SnugZ USA in our business traveling expeditions to numerous trade shows and conferences across the country. We’re lucky to have her skills and talent on board. Those who have gotten the opportunity to meet and work with Janice can vouch for her colorful personality, skilled competencies, and passion for our industry. 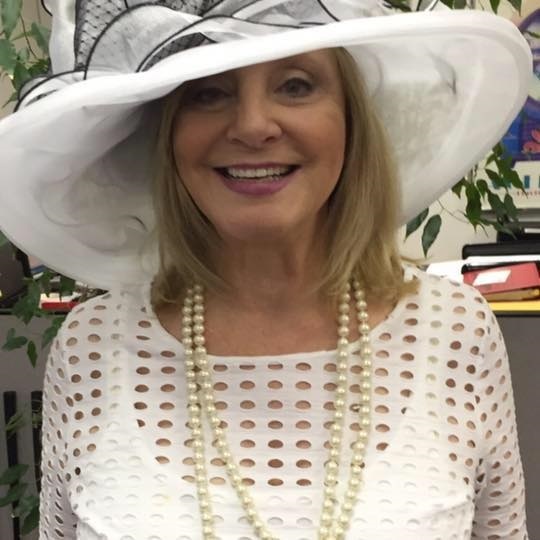 If you have any remaining questions, you are always welcome to contact Janice at her direct line at 888-447-6840 ext. 9548 or janice@snugzusa.com. 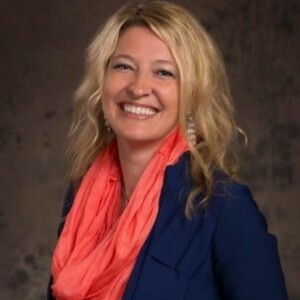 We’re proud to announce our very own Vice President of Sales, Brittany David, is one of two Supplier candidates up for election in PPAI’s Board of Directors class of 2020. It’s a true honor to be nominated for this position. One has to be involved ranging from, but not limited to: regularly attend the PPAI Expo, obtain strong personality and diverse business experience, employee of a supplier in good standing, active in non-industry business professional and community organizations, and be involved with education services on committees, advisory councils, or task forces. She is adored by both suppliers and distributors alike and understands the importance of relationships, integrity and authenticity. Brittany is prepared for the additional time commitment that will be required of the position and is no stranger to stepping up to the plate. Here at SnugZ USA, she oversees a team of more than 40 sales members and together they not only meet their quarterly goals but exceed them. She is adored by both suppliers and distributors alike and understands the importance of relationships, integrity and authenticity. Brittany has been a SnugZian for just under five years now; we’re incredibly proud of her and very advantaged to have her on our team. 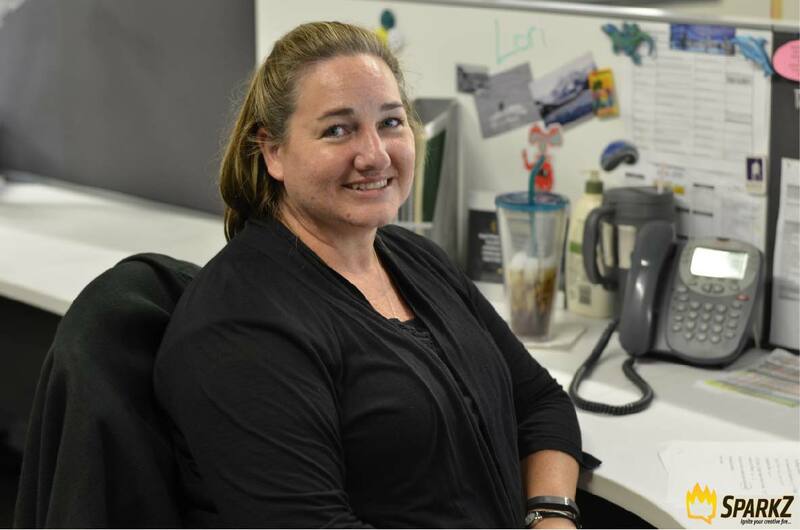 Prior to shining at SnugZ, she got her introduction to the Promotional Products Industry at SAGE as a Tradeshow Management Services Manager. 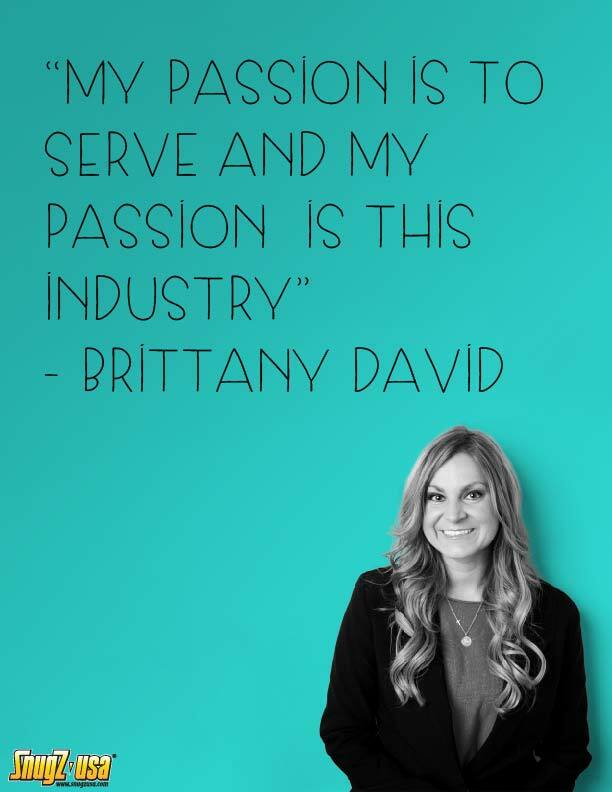 Along with her Promo expertise, Brittany is someone who constantly radiates positive vibes, possesses a loving heart for community service, is a visionary, and will not take “it can’t be done” as an acceptable answer. Those who know Brittany can vouch for her vibrant personality, dynamic energy, robust work ethic, absorbing smile, and exceptional consideration and passion for the Promotional Products Industry. She is exceedingly instrumental to the success here at SnugZ USA! We know how remarkable she is but also take a look what influencers in our industry have to say about her. 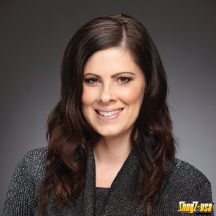 “I have known Brittany David both on a business and personal level for some time and I have never found anyone to be more capable and caring than she is. Her professionalism shines through at work and it is evident that she cares about every client and every order, big or small. Personally she is a woman of character and value and I am lucky to be able to know her and to call her my friend. She has abilities that take most people years to learn and skills far beyond her years. “Brittany’s work ethic is second to none, and she takes commitment, drive, and dedication to a whole other level. She has an incredible way of being extremely business savvy while also being a genuine advocate for her customers. Voting will begin September first and you can access that page by clicking here. Suppliers and Distributors can vote and stay tuned to our blog for updates. Lastly, you can learn more about Brittany’s Campaign and stay informed with her activity by liking her FaceBook page, VoteBrittany. We have many prodigies in abundance here at SnugZ USA; however, one can understand the difficulty in obtaining the task to select only three to be in the limelight for their commitment and hard word. Nonetheless, to our surprise, every month the bar is set higher and higher. After meeting one-on-one with these outliers, it’s no surprise these select few rose out among the rest. Their tenacity and diligence at work is unmistakable and worth the recognition. As a result, we are proud to announce and share our stellar SnugZians who rise above the bar. 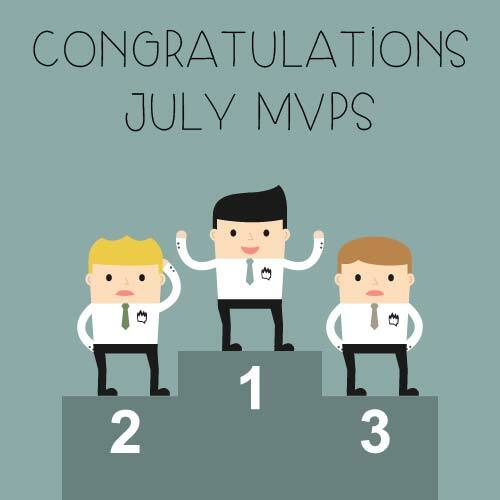 July 2015 MVP’s are: Lori Holdener, Saul Alcala, and Valerie Pelca. Lori is a prime example of a SnugZian dedicated to the max. She has been with us now for 13 years and we’ve never witnessed anything less than a phenomenal effort from her. Lori consistently operates at 110% in her responsibilities every day, week after week. It’s no stranger for her to communicate across various departments (customer service, order entry, marketing, and many more) and they all vouch how respectful and pleasant she is in her communications. A hidden talent of Lori’s is she’s a marvelous cook. She spoils her team and surrounding others with her yummy pastries and come birthdays your diet is guaranteed to make an exception. As the customer credit manager, she’s no stranger to experiencing heightened phone calls but that’s no problem for this seasoned vet. Lori is a skilled artisan when it comes to handling these type of calls and has a knack for making clients feel appreciated and attentive. We’ve received countless feedback on how much customers enjoy working with her. Customers and co-workers alike describe her as someone who radiates good vibes, obtains a robust work ethic, and enjoyable to work with. We are fortunate to have her part of our team and this recognition is far overdue. 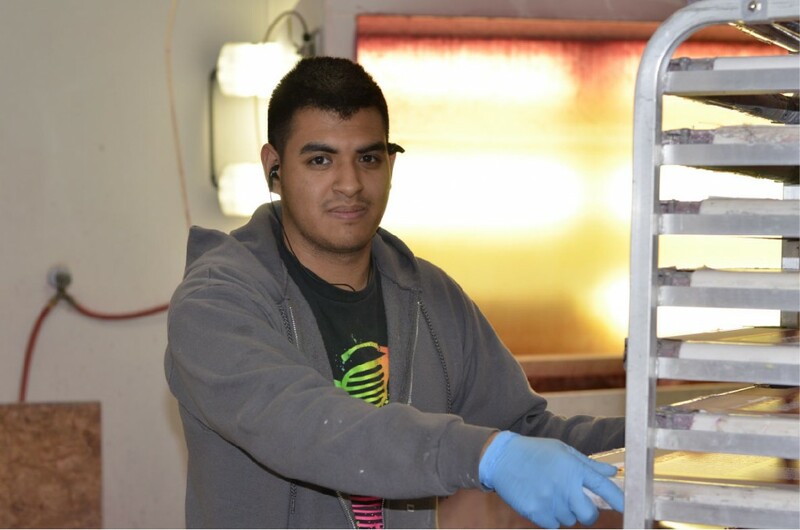 We asked Saul’s supervisor to describe his work ethic here at SnugZ USA and this is what he had to say. “I compare Saul to the ninth inning pitcher in a baseball game—a closer. Saul is the person I repeatedly look to for the last of the day push to get jobs done. He is asked to perform under pressure and he encompasses the tenacity and composer to do so with ease.” That being said, Saul is our Mariano Rivera at SnugZ. He is skilled, smart, suave, and dependable. Saul shows up to work with his mind in the game and hits the shop floor wasting no time. A true leader, he leads by doing and is an example to his team. Without reluctance, Saul shares his work insight with those he works with to help improve and develop their knowledge in manufacturing. His bilingual skills are very handy and he is fluent in all process in his department. Every day he can encounter various curve balls but Saul manages to adjust at the plate and cracks any challenge. We thank and recognize Saul for his remarkable performance; his presence truly makes SnugZ a better place to work at. Saul has been a part of our family for a decade now. Originally from Inglewood, California, Utah has grown on him and he now resides in West Valley City. When he’s away from work Saul enjoys spending time with his 3 children and wife—Christina. Some of his favorite hobbies are barbequing ribs and Carne Asada, going to the shooting range, and running. 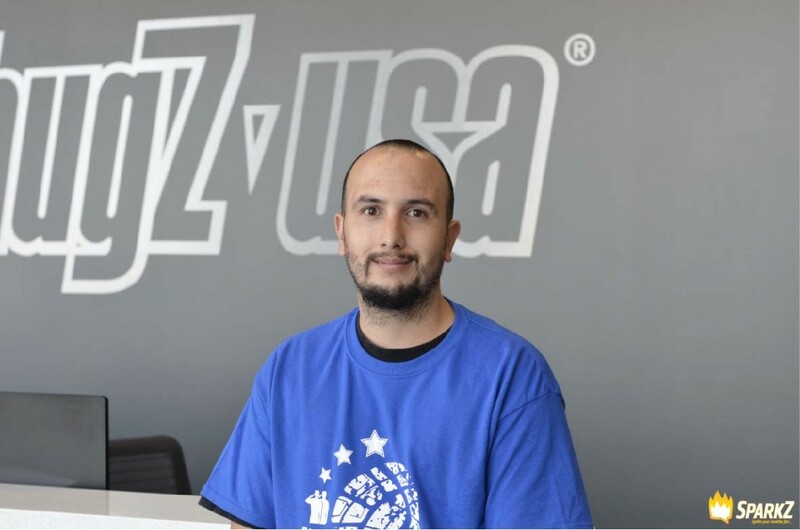 Just last month we had a Corporate 5k with our health insurance and Saul was one of the first to sign up. Valerie (Val) is the current Team Lead of our swing shift crew in our Labs department and we’re very grateful to have her. She’s been an irreplaceable member of our team since her starting role. She’s willing to perform any and all tasks asked of her and with a small margin of error. Val is the last one standing from our initial swing shift crew and we value her dedication and persistence during our growth. It was recent that Val was promoted to the Team Lead position and her crew has performed incredibly under her leadership. Their output has been noticeable and with great remarks. When I first met Val she was everything everyone told me she would be: approachable, calm, smart, amusing, and likable. She always has a smile on her face and perhaps one of the most optimistic individuals I have met. Her “it can’t be done” personality is blatant in her dealings. Away from her responsibilities at work, Val and her fiancé, Manny, are proud parents of three boys. She couldn’t be happier; she enjoys taking them to outdoor events such as: camping, fishing, swimming, and really anything outdoors. In addition, they have more critters of their own; they own a Ball Python and Toy Poodle. She just surpassed her year mark with us two months ago and we look forward to the many more years together. Thanks for being a great example at work and at home Val. Memorial Day is now behind us, schools are wrapping up the calendar year, and pools have officially opened. Now that June has arrived, get ready to embrace the days filled with sunny skies, fresh cut lawns, and family vacations taking off–also known as summer time. Last week, we asked our veteran National Sales Rep, Katy Burum, for her recommended item of the week for those in a pickle on what to suggest to your customers. She didn’t have one single item for this popular time of year but rather an entire category—Sunscreen and lots of it! Katy is no stranger to making recommendations. 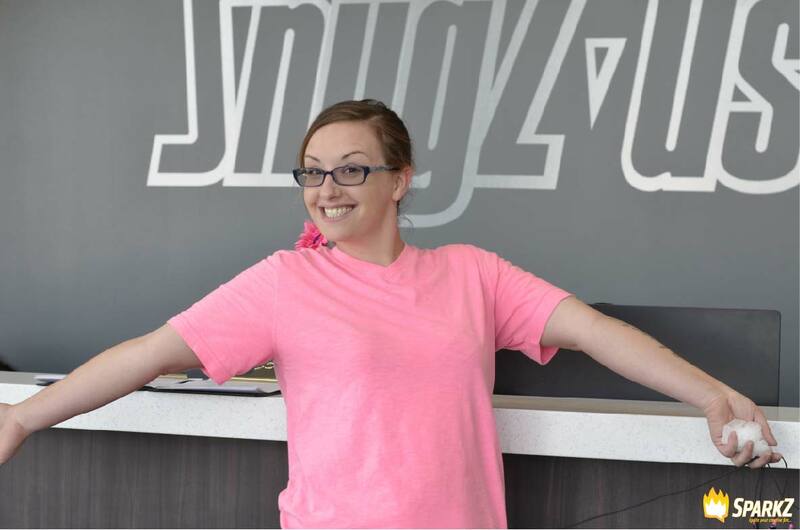 She has been a top Sales Representative at SnugZ USA and is going 13+ years strong with us. Her keen knowledge and robust work ethic did not go unnoticed either; this year, Katy was recognized as the #5, out of top 20, Supplier Sales Representatives by ASI Advantages magazine. Whether your customers have plans this summer to visit a National Park, go on a cruise, or getaway trip to the beach, you’ll want to consider getting them Katy’s recommendation because accompanied with these fun filled days are threatening ultraviolet rays and nasty sunburns. For many of us, sunscreen can be an easily forgettable item to pack but fun in the sun comes with responsibility. Though, initial sunscreen application is just not enough. Did you know experts recommend applying sunscreen 30 minutes before going out? Moreover, be sure to reapply at 80 minutes, especially if you’re sweating or swimming. Don’t be conservative on the amount you slather up either because most of us don’t put on enough. The recommended amount use of sunscreen for an adult is 1 oz., or a full shot glass. How do you calculate this formula? Let’s say you step outside and within 10 minutes you begin to burn. If you were to apply an SPF 15, at the rate your skin burns, that means it will protect you up to 150 minutes without burning. However, before you make a dart for the beach, this equation isn’t accurate for everyone and those who participated in the testing may burn faster than you. It’s important to know your skin type because this will play a role in finding out which SPF works best for you. To find which skin type you are, click here. Now begs the question, SPF 15 vs SPF 100, is there a significant difference? Absolutely. Did you know the recommended use is between 15-50. 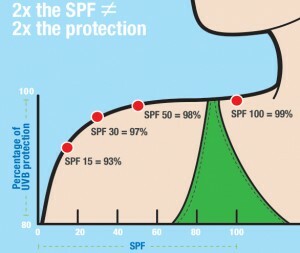 Beyond SPF 50, you’re really not getting that much more skin protection, a mere 1%. Take a look at the chart below provided by Consumer Reports. An SPF 15 will protect you at a level 93% of UV Rays and SPF 50 will protect you at 98%. No sunscreen will protect you 100%. All in all, Sunscreen is important. Not only to protect your skin from getting sunburn but Melanoma has never been more of a threat. Melanoma is one of the seven most common cancers in the US and largely rising among young adults. According to the Skin Cancer Foundation, an estimated 73,000+ new cases of Melanoma will be diagnosed this year and it accounts for the majority of skin cancer deaths. Katy highly recommends sticking with sunscreen as you think about your customers this time of year. Below we have our starting sunscreen lineup for you to choose from. Believe us when we say they’re sun-sational. ZSUNPLSP20: 2 oz. SPF 50 Squeeze Pouch Sunscreen. It’s a new product of the year TSA carry on. Also available in 1 oz. and SPF 30. ZSUN19-ZLBPWT.HC: Lip balm and Sunscreen SPF 30 combo with Carabiner attached. One goes where the other goes. ZSUNJT: Jumbo Sunscreen SPF 30 Tubes for outdoor events like golfing or concerts or kids camps. 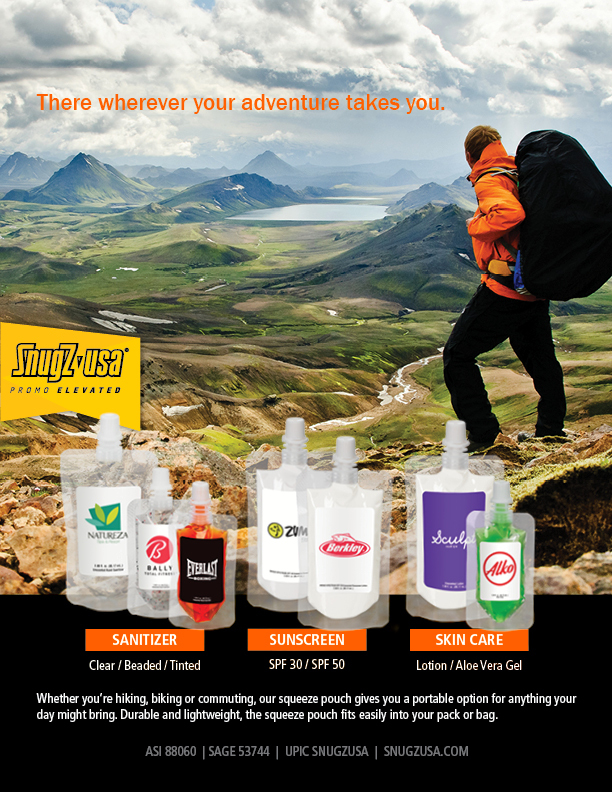 ZSUNPLIRCP: This two-fer is a Suncreen SPF 50 + Bug repellent combo, DEET-free, another handy item for any outdoor event. ZSUN10: 1 oz. Round Bottle with SPF 30. This is a perennial best seller. 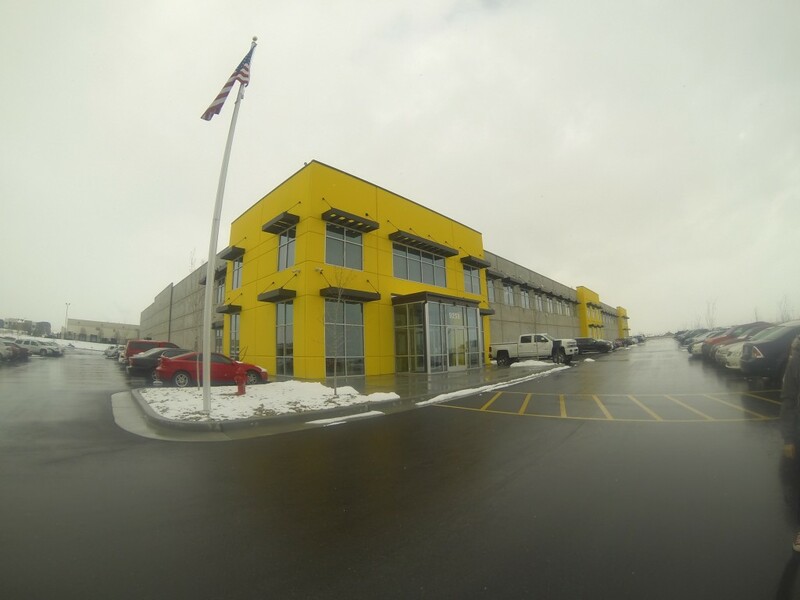 To receive a quote or get a question answered, you can reach our Customer Service department at 888-447-6840. May is a month packed with a number of events. College finals are wrapping up, graduates to-be are preparing for their big ceremony, don’t forget mom’s present for Mother’s Day, and one of the biggest vacation holidays of the year is approaching fast—Memorial Weekend. P.s. don’t forget the sunscreen. Along with this action packed month, SnugZ USA would like to recognize May’s Most Valuable Players. We’ve receive feedback from our Managers and Supervisors on individuals who have demonstrated exceptional work and gone above and beyond their call of duty. This month we would like to award Sam Bairagee, Alex Ortiz, and Amanda Barlow as our 2015 May MVP’s. In the short time that Sam has been with SnugZ, he has proven his value to the Marketing/Art Team and to the company with his outstanding work ethic, high attention to detail, and positive attitude. 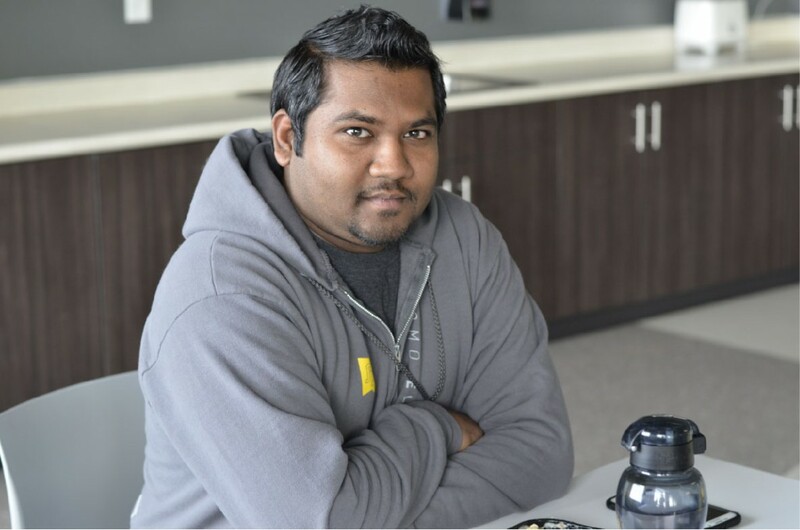 No matter how busy he is, he exemplifies our core values in all he does and treats his co-workers like his customers. Alex has been a SnugZian for over a year now and has implemented and displayed his hard work ethic. Just recently he was promoted to become the Team Lead in our Burn Screen department. Alex has stepped up as a leader these past couple of months while we experienced some employee turnover and his help did not go unrecognized. He is always willing to work overtime and pick up some additional projects to help make the department successful. Just in the past month, he has been reclaiming, stripping screens of excess paint which can be tedious work, screens sometimes all shift and he never complains. Alex is a great asset to the team and supports everyone around him. Alex lives in Salt Lake City now but he derives from four hours south in sunny St. George, Utah. There he attended Dixie High for four years and was involved in the ROTC (Reserve Officers’ Training Corps) program; he was a lieutenant during his time with the group. Naturally, leadership and discipline come innate to Alex. He hopes to join the Air Force Academy in the future one day. When he’s away from his work duties, he watches over his younger siblings. He recently took his younger brother to watch the new Avengers movie. In July of this year, Alex plans on traveling to Mexico to visit his youngest brother and treat him to a visit to Disneyland. We’re very glad to call Alex a SnugZian and part of the team. Appreciate all you do Alex, we salute you. You’re team is excited for your leadership. Amanda is a recent hire but her work ethic reflects that of a veteran. In her short time at SnugZ she has already proven herself to be incredible asset and it’s hard to notice her abnormal ability to easily pick up new skills. Since her inception with us, she has demonstrated her willingness to go above and beyond her job responsibility and to meet any crazy request we send her direction. She works overtime without any reluctance and capable of working odd hours whenever asked. Once again, her ability to quickly learn a new skill has helped her excel in every task presented upon her. She is an inspiration to those around her. We’re uber grateful for her positive attitude and hard work. She reflect every characteristic of a team player. Amanda is originally from Colorado City, Colorado. She comes from a family of 10 children! Amanda is the sixth child and one of four daughters. She currently lives in South Jordan, Utah with her boyfriend. Her favorite dogs are Dachshunds. When she’s not at work she enjoys a good nap and has a deep passion for baking. Ginger cookies are her favorite. One unique hobby of Amanda’s is modeling. She always had a great admiration, delight, and connection with models and runways. Just last week she finished her first photo shoot. Lastly, she’s looking forward to her summer vacation she has planned in August in San Diego, California. In February, SnugZ USA welcomed a new member to its Executive Team—Mr. Justin Gukeisen, Director of Quality Control (QC). Justin isn’t a successor to a former administrator, but rather he is the first Director of QC in SnugZ USA history. With his addition, the new 2015 Executive Team is now comprised of 11 members. No matter the industry, it’s vital for every firm to pursue innovation and remain competitive. As a result, the Director of QC position was created to dissect our existing business manufacturing process, identify bottlenecks and constraints, eliminate waste, and consistently improve them to help ensure the company’s long term success. A little bit about Justin is he’s a local from Utah–born and raised. A family man at heart, Justin is married to his wife, Lana, and together they have three children and one on the way. A member of the Church of Jesus Christ of Latter Day Saints religion, he has a calling in his ward’s bishopric and when he’s not attending to family, church or work responsibilities, Justin enjoys pick-up basketball games. Lastly, he’s hard to miss around the office, just look for Blue, Silver, and Black. This avid Detroit Lions fan proudly wears his team’s colors and must own the biggest Lions wardrobe collection of any fan in Utah. He brings with him an extensive work history in manufacturing, robust education, and seasoned skill sets as a leader and manager. Justin was with his previous company, Spectra Symbol Corp., for 14 years and his last position was the Chief Operating Officer (COO). 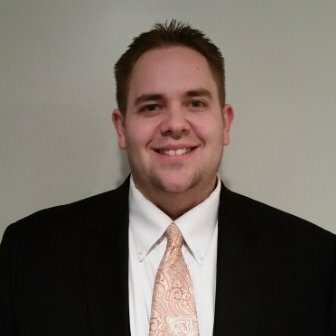 At Spectra, Justin held several positions such as: Janitor, Printer, Supervisor, Sales Territory Manager, Operations Manager, and Director of Specialty Products before COO. 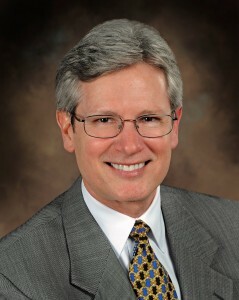 He earned his Bachelor of Science in Business Management in 2011 from the University of Utah, David Eccles School of Business and returned two years later to pursue and receive an Executive Masters of Business Administration (MBA). Lastly, he encompasses experience in consulting nearly a dozen firms in the principles of Lean Manufacturing and process improvements. Justin’s background helped him stand out among potential candidates but what truly helped him outshine others was his profound passion for the manufacturing industry. His gentle personality and commitment to help improve people and processes was a characteristic that struck a chord with decision makers. All of SnugZ’s executives have been hired from within, working years in the organization; however, Justin was recruited externally, an uncommon practice here. The prospective hopefuls were selected by referrals only—once again, attesting to his remarkable qualifications. Naturally, Justin has wasted no time here at SnugZ USA and has hit the ground running from day one. During his training, he logged a keen ear to supervisors’ frustrations and constraints. He manages a team of 10 individuals and together they inspect all processing orders to ensure they are meeting customer specifications and are compliant with regulatory standards. Furthermore, Justin has been asked to facilitate a course in Lean Manufacturing in our SnugZ University program—an in-house training curriculum designed to offer developmental courses for all employees. Some of Justin’s goals are to help introduce and sustain all elements of Lean Manufacturing, empower all those he comes in contact with, and contribute to the executives’ vision for the company. Justin has been an excellent fit for the SnugZ organization and culture thus far. Several of the manufacturing supervisors have approached leaders to express their excitement to begin working with him and his aspirations. It’s safe to say, we’re all ecstatic to move forward with his visionary leadership and targeted endeavors. You can’t operate a great organization without great talent. And we have many winners here at SnugZ USA; each individual delivers their integral part in contributing value to our supply chain. Their hard work, passion, and constant strive to learn has been instrumental in aiding our operations run effectively and efficiently. As a result, we find it paramount to recognize and share their countless efforts. Each month, SnugZ USA publishes a newsletter which includes birthdays, anniversaries, upcoming calendar of events and activities, announcements, comics, informative articles, and MVPs. Each month three individuals are nominated by their peers for the MVP award and February 2015’s Most Valuable Players are: Erika Bazan, Ana Vallejo, and Danny Montiel. Erika is one of our most focused individuals we know. She is not only dedicated to getting her work completed but seeks out solutions that will allow our company to be more efficient. Even when a road block is encountered, she finds a way to remain positive and never falters to find a solution—a terrific quality to obtain. She is a powerhouse of SnugZ product knowledge and is always willing to answer questions or to share new information with others members. Perhaps the best part about working with her is her natural ability to be more than just a co-worker but a friend and collaborative member of the team. This bright spirit is always willing to help with work or to offer her insight when someone is in need of support. We’re uber happy Erika was nominated by her peers and receiving this award because she embodies the SnugZ core values and demonstrates them in her everyday work and interaction. We are truly lucky to have her. Ana has been a member of the SnugZ family since January 22, 2010! She is exceedingly dedicated to her tasks and all meanwhile performing them with notable quality ratings. She obtains a positive attitude and is dependable to stay after hours when jobs run late and need immediate attention. Her superiors are grateful to have her on the team and she is an amazing influence to her peers. Danny has been with us a short time but has already made a huge impact and impressed everyone he’s come in contact with. He’s proven himself worthy of a dependable team player. He accomplishes all tasks with quick execution. Danny was recently promoted to Assistant of the Hand Fill area and he is already thriving in his new position. We appreciate Danny’s contribution to our organization and look forward to the many more accomplishments he has to bring in the future. Keep up the great work Danny! Thanks to these All-stars for putting in their hard work and we’re happy to recognize their efforts.